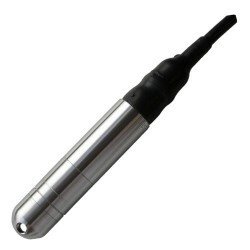 SDI-12 digital interface liquid level and temperature sensor for submerging in seawater water to depth of up to 50 metres. This sensor has a digital output which conforms to the communication standard for environmental monitoring equipment. For compatibility with salt water the sensor is manufactured with a ceramic sensing diaphragm, Marine bronze housing and TPE coated cable. Please complete form below to request a quote for 50m seawater depth & temperature sensor with SDI-12. Send us your enquiry for 50m seawater depth & temperature sensor with SDI-12 to get assistance with this product type.